ThyssenKrupp unveils the elevator of the future (sort of). If you find conventional lifts tediously vertical or just have an obsessive fascination with magnets, here's some good news. 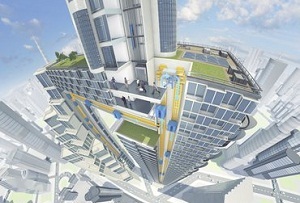 ThyssenKrupp has developed a magnetic, cable-free lift that can move side to side as well as up and down. 'The era of the rope-dependent elevator is now over, 160 years after its invention,' the German congolmerate's Elevator division proclaimed, as it outlined the new Willy Wonka-esque lift's advantages over the cable-pulled ones, which are just so 20th century. ThyssenKrupp's new MULTI lifts, a prototype of which it hopes to have up and running by the end of 2016, will use powerful magnets to propel them, reducing friction and crucially allowing more than one lift to travel in the same shaft. Given that MULTI lifts will be able to travel at 5m/s, this will apparently reduce waiting times in high rise buildings to no more than 30 seconds. ThyssenKrupp didn't elaborate whether that prediction takes into account scoundrels pressing all the buttons or idiots getting their bags stuck in the doors, but that's by the by. Without the need for cables, the new lifts will require smaller shafts and be free to travel horizontally, which could reduce the considerable footprint of elevators on large buildings (up to 40% of the total footprint for some skyscrapers) and allow 'unorthodox' designs that aren't dependent on vertical shaft structures. This might all sound fantastically futuristic, but we've been here before. Toshiba announced the world's first magnetic lift, MagSus, in 2006, but you won't find one of those in your nearest John Lewis. Until these things start selling commercially, they will remain in the realms of fiction. Perhaps that's ThyssenKrupp's inspiration. In Douglas Adams' Hitchhiker's Guide to the Galaxy, Happy Vertical People Transporters do much the same job as ThyssenKrupp's MULTI, only they're sentient and can take you to the floor you want to go before you know you want to go there. The drawback is that they're aware of their miserable condition, and spend most of the time moping in the basement, avoiding people. Let's hope ThyssenKrupp steers clear of artificial intelligence and sticks with good old fashioned buttons, eh?